This article is about Lucario's appearance in Super Smash Bros. Ultimate. For the character in other contexts, see Lucario. Lucario (ルカリオ, Lucario) is a playable character in Super Smash Bros. Ultimate. It was confirmed as a playable character on June 12th, 2018. Lucario is classified as fighter #41. 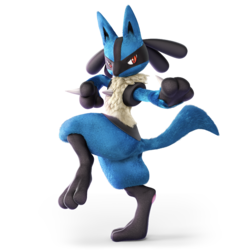 Sean Schemmel, Daisuke Namikawa, Jean-Marc Delhausse, Carlos Lobo, Gerhard Jilka and Luigi Fantino's portrayals of Lucario from Smash 4 were repurposed for the English, Japanese, French, Spanish, German, and Italian versions of Ultimate, respectively. Play VS. matches, with Lucario being the 27th character to be unlocked. Clear Classic Mode with Yoshi or anyone in his unlock tree, being the first character unlocked. Have Lucario join the player's party in World of Light. With the exception of the third method, Lucario must then be defeated on Spear Pillar. Lucario has received a mix of buffs and nerfs in the transition from Smash 4 to Ultimate, but was generally nerfed overall. Lucario's overall mobility has been greatly improved due to faster horizontal movement, while the universal 3-frame jumpsquat further improves Lucario's ability to traverse the stage. Many of its attacks in general, notably its dash attack, forward smash, neutral aerial and forward aerial, are more reliable and less of hindrance, while its special moves have also been improved: Aura Sphere can now be cancelled into any ground attack during a charge, allowing for mixup options, Force Palm has more range, Double Team can now home in on opponents and is much faster overall, and Extreme Speed is overall safer due to its ending and previously notorious landing lag both being lowered. Lucario has received nerfs, however. The most notable one is to its Aura mechanic, as Lucario's Aura multiplier is worse than it was in Smash 4 despite 1v1 multipliers now giving a slight advantage. This, when combined with the universal weakening of the rage mechanic, makes Lucario less powerful at higher percentages, while its reduced weight makes it even easier to KO. Furthermore, some of Lucario's most reliable moves, such as down aerial, have been made less effective. While Lucario still has a strong recovery, Extreme Speed's controls have been modified to the point where holding down the control stick can accidentally lead to self-destruction. Finally, the throws have increased knockback yet don't function as KO options; this, in addition to the changes in DI and air dodging, has the overall effect of limiting or even outright removing some of Lucario's previously guaranteed combos from throw, which were some of the only reliable ways for it to add damage. It is currently unknown how Lucario will fare in the Ultimate early meta, as its tournament representation is currently lacking. Lucario's model has a more subdued color scheme, and its fur has a more detailed texture. Aura is now cyan in color instead of indigo at earlier percentages, and its visual effects are smoother. At higher Aura levels, the flames produced are more intense, becoming indigo in color, which leave behind a trail as Lucario moves. Purple electricity starts emanating from its paws, and the spikes on each paw begin to glow white. The appendages on the back of its head also rise up as Aura grows in power. Many of Lucario's attacking animations have been updated from SSB4. Notably, Lucario stands on one foot more in its attacks, particularly with its smash attacks and Double Team. Like all characters, Lucario's jumpsquat animation now takes 3 frames to complete (down from 5). Lucario walks slightly faster (1.05 → 1.103). Lucario runs faster (1.55 → 1.705). Lucario's initial dash is significantly faster (1.8 → 2.255). Lucario's air speed is much higher (1.09 → 1.281), now being on par with Wolf's. Lucario's air acceleration is higher 0 → 0.01 (base), 0.07 → 0.08 (additional), 0.07 → 0.09 (max). Lucario's traction is higher (0.0736 → 0.116). However, due to traction being significantly increased across the cast, he no longer has the highest traction in the game going from first out of 58 to eighteenth out of 76 characters. Lucario is lighter (99 → 92), making it more difficult to survive at higher percents to take advantage of Aura. Aura increases in strength faster at lower percentages, reaching base damage at 65% (70% in SSB4), but slower at higher percentages, reaching a maximum of 1.6x power at 190% (down from 1.7x). Aura's strength at 0% is unchanged (0.66x). Aura's effects have also been modified regarding placing. While Aura multipliers when at an advantage in 1v1 battles have been increased slightly, Lucario now only has a -1 placing as opposed to also having a -2 placing, reducing its multiplier when it is at a disadvantage down from a maximum of x1.333 to x1.125. Furthermore, this new multiplier applies beyond 1v1, also reducing the maximum multiplier of a four player match down from x2 to x1.125. This removes the Anubis Combo and greatly reduces Lucario's extreme comeback factor, which makes Lucario more reliant on taking damage to reap the benefits of Aura. Neutral attack's hits connect much more consistently. All three hits of neutral attack have less ending lag (FAF 34, 38, 41 → 32, 35, 39). The first two hits of neutral attack can jab lock opponents. Neutral attack's first hit comes out later than before (frame 6 → 7). The first hit has fewer active frames (frames 6-8 → 7-8). The final hit has fewer active frames (frames 9-11 → 9-10). Dash attack now has a sweetspot located on Lucario's foot during the early frames of the attack. This new sweetspot deals more damage (10%) and knockback than the rest of the attack, letting it KO earlier. The sourspot of the clean hit does more damage (8% → 8.5%). Lucario now lands on its feet after using dash attack; previously, it fell on its side after the kick. Forward tilt has increased range. Forward tilt's hits chain together much more reliably. Forward tilt has a new animation, with Lucario leaning back before the palm thrust. In addition, the updated visual on the Aura effect matches the hitboxes much better. Up tilt has increased range; it is now able to hit opponents on Battlefield platforms consistently. Up tilt has a new animation; Lucario jumps slightly higher when kicking, and kicks in an overall more animated fashion. It then quickly hops back into place at the end of the attack. Down tilt has less ending lag (FAF 25 → 23). This improves its safety and combo potential. Down tilt's new animation has Lucario crouch low to the ground while kicking. This allows it to lower its profile and dodge more attacks while using down tilt. Forward smash has increased range. Forward smash becomes active earlier (frame 22 → 19). Forward smash has more vibrant Aura effects. Forward smash's animation is more animated and snappy compared to SSB4. It also now ends the attack standing on one foot. The new animation of forward smash has Lucario lean back at the start of the attack, allowing it to evade attacks before retaliating with its own. Up smash has an altered animation, with Lucario raising its leg much higher while releasing the blast of Aura. The charging stance is different, and the blast of Aura is much wider than before to match the hitbox more accurately. Down smash has a new animation; instead of raising its arms into the air and bringing them down, Lucario now briefly stands on one foot before stomping it to the ground while simultaneously releasing Aura from its palms. The charging animation of down smash now has Lucario fold its arms while crouching in front of its chest instead of waving its arms in a circular motion. Due to the change in stance, Lucario is less vulnerable to attack while charging down smash. Neutral aerial now hits twice, regardless of whether the opponent is in front of or behind Lucario. This allows the move to deal more damage in general and hit behind him much sooner, increasing its potency. Neutral aerial is able to drag opponents with the attack, allowing for more followups. Neutral aerial has reduced landing lag (9 frames → 5). Neutral aerial's first active frame is later than before (frame 8 → 10). Neutral aerial's first hit lasts for a longer period of time (frames 8-11 → 10-14). The second hit comes out earlier (frame 22 → 18). The second hit lasts a shorter period of time (frames 22-29 → 18-21). It auto-cancels earlier (frame 39 → 36). Its initial auto-cancel window was shortened (frames 1-7 → 1-4). Neutral air has a new animation; Lucario spins more quickly than it did in SSB4. Forward aerial has reduced landing lag (18 frames → 9). Back aerial becomes active sooner (frame 16 → 13). Back aerial deals less damage (15% → 14%) and thus less knockback. Back aerial has more ending lag (FAF 49 → 50). Its initial auto-cancel window has been lengthened (frames 1-3 → 1-4). The burst of aura from Back aerial's animation better matches it's hitbox. Up aerial has decreased landing lag (22 frames → 13). Up aerial has fewer active frames (10-15 → 10-13). Up aerial has an altered animation, with Lucario backflipping following the initial kick. Down aerial stalls Lucario's movement less on successive uses. Down aerial has more landing lag (9 frames → 12). Forward throw is now a two-hit move. This change also grants the move a collateral hitbox to hit opponents near Lucario. Down throw has slightly less knockback growth, allowing it to combo for longer. Aura Sphere is visually closer to how it appears in recent Pokémon games. It has an "energy absorption" effect while charging and no longer emits a trail of smoke when launched. Aura Sphere can now be jump-canceled, even in the air. Additionally, it can now be canceled into any grounded option while charging with an advanced technique called Charge Storage Cancelling. With Lucario's increased air speed, this makes it possible to edge-guard oppenents by charging Aura Sphere and then cancelling it into an aerial, as well as improving its movement when combined with B-Reverses, Wavebounces, etc. Moving the control stick down has Lucario spotdodge, much like how moving it left or right has it roll. Lucario cannot shield immediately out of Aura Sphere, making it less safe to charge. Lucario cannot use its standard grab out of a charging Aura Sphere without shielding, as pressing the Z button fires the Aura Sphere. The aerial charge animation for Aura Sphere was altered; it now more closely resembles the grounded charging animation. Force Palm has increased grab range. Force Palm's projectile deals less damage with the far hit (7.56% → ~5.4%). Force Palm's hitbox now matches its Aura graphics more closely. Force Palm's grab triggers Special Zoom if Lucario has at least half of its maximum Aura. The animation for Force Palm has been completely changed; instead of pulling its left paw back before thrusting it forward with a stomp to release a blast of Aura, Lucario now moves its paws in a circle around its body while crouching low to the ground before gathering its paws together and releasing a blast of Aura from its left paw. Extreme Speed has less endlag and landing lag. Extreme Speed now has a hitbox upon directly crashing into the ground or a wall, making it safer to use for recovery. Crashing into a wall now sends Lucario upward as opposed to stopping it in place. This greatly increases the safety of the recovery. Extreme Speed's controls have been modified; the initial flight direction is locked in a short period of time before flight begins, which can lead to unintentional self-destructs. Extreme Speed travels less distance overall. Extreme Speed now halts at the end of the move, making it worse for recovering at low percents. The animation for Extreme Speed has been updated; Lucario now gathers Aura in its paws at the start of the move. If it is grounded, dust ripples appear around Lucario as it gathers Aura. Additionally, the streams of Aura during flight are much bigger and more colorful than before. At the end of the flight, a gust of wind envelops the front of Lucario to indicate the attack portion of the move. Double Team deals more damage (11% → 12.5%). Double Team's counterattack activates faster (frame 28 → 16), making the attack much more consistent. Lucario leaves blue-colored afterimages of itself in the location where it stood just before the attack. Double Team has less endlag on an unsuccessful counter (80 frames → 71), decreasing the window of time where Lucario can be punished. Double Team can now track opponents that activate the counterattack; Lucario will teleport to the attacker's location (within a certain range) and start its counterattack. Double Team now slows down time for the opponent that attacked Lucario. This allows Double Team to punish many more attacks, greatly increasing its reliability. Double Team has fewer active frames (frames 5-39 → 5-24), no longer having the longest frame window in the game. Double Team has significantly fewer intangibility frames (5-39 → 4-13), no longer covering the entire counter window. Double Team's momentum in the air carries over into Lucario's own movement, which both benefits and hinders its recovery potential, as it can help with recovering when facing towards the stage, but prevent recovery (or even lead to a self-destruct) when facing away from the stage. The animation for Double Team has completely changed; instead of moving its arms in a circular motion while crouching, Lucario now stands upright with its left leg raised while holding a pose. It then pulls its right paw back while holding its martial arts-like stance. A vortex of wind surrounds Lucario throughout the entire animation. Lucario's Final Smash has been reverted to Aura Storm. It now Mega Evolves into Mega Lucario before performing the attack. Compared to Aura Storm in Brawl, the beam fired is much wider, improving the move's horizontal reach. Aura Sphere has less hitlag during the charge, allowing characters to escape and shield drop much easier. Aura Sphere does less shield damage. Lucario's moveset is affected by Aura. Each move lists the percentages according to Lucario's damage: 0%/65%/190%. Lucario's Aura effects also change in regard to placing. When at a -1 placing, Lucario's Aura gains a multiplier of ×1.125. Lucario using a Aura Sphere with max strength Aura as shown by a Skill Preview in Ultimate. “ As Aura's power increases, your attack power increases as well. The more unfavorable the match is for you, the more power you gain. Aura Sphere will get bigger, and the speed and power of it will increase. You can also leap higher and quicker when using Extreme Speed. 2.5% The kham choui (a downward sweeping punch in Shaolin Kung Fu), followed by the choong choui (a jab-style punch in Shaolin Kung Fu), followed by a stretch kick. 4% (hit 1), 6% (hit 2) The kap theai choui (a low-angle cross-style punch in Shaolin Kung Fu). Hits twice. 6% (foot), 5% An outside crescent kick above itself. 5% A kneeling Hapkido-style shin kick. 8.5% (sourspot), 10% (sweetspot), 7% (late) A flying kick. 16% (clean), 13% (late) A double palm thrust, which emits a burst of Aura. 4% (hit 1), 14% (clean hit 2), 9% (late hit 2) A modified version of the long choui (an uppercut-styled punch in Shaolin Kung Fu), while emitting a blast of Aura. Hits twice. 8% (hit 1), 6% (hit 2) Spins while emitting Aura from its paws. 14% (clean), 13% (late) The sou choui (a sweeping punch in Shaolin Kung Fu). 11% (clean), 6% (late) An upward front kick, with Lucario backflipping. 5% (hit 1), 6% (hit 2) Stomps twice, emitting blasts of Aura with each stomp. 1.3% A surge of Aura. 5% (hit), 3% (throw) Shoves the opponent away. 10% The tai otoshi, a Judo throw. 5% (hit), 6% (throw) The pao choui (an uppercut-styled punch in Shaolin Kung Fu). 7% Holds the opponent over its head and then slams them into the ground. Can combo into 3 forward aerials at low to mid percents. 7% Same as its frontal floor attack. 9% Performs a double palm thrust that emits a small blast of Aura while climbing up. Aura Sphere 6.9%~17.2% (move), 0.6% (charge loop) A chargeable, condensed sphere of Aura. Pressing the special button again will make Lucario fire the sphere. Its size scales with Aura. The charge can be cancelled into tilts, smash attacks, and aerials. It can also cancel into a dodge, and be jump-cancelled. Force Palm 11.8% (close blast), 5.4% (far blast), 13% (throw), 10% (throw collateral) Fires a stream of Aura. Its blast's range scales with Aura. If the opponent is close to Lucario, the move acts like a grab, with Lucario grabbing the opponent and then striking them with a palm thrust at point-blank range. At half of its maximum Aura or more, it triggers Special Zoom. Extreme Speed 6% (dash), 4% (impact) Propels itself in a predetermined direction by blasting steams of Aura from its forepaws. Has a hitbox at the end of its animation, and upon crashing directly into a wall or the ground. Extreme Speed's distance scales with Aura. Double Team 12.5% Performs a kata. If Lucario is attacked, it will disappear while emitting afterimages and then counterattacks with a flying kick. The direction Lucario kicks in can be controlled. Lucario will also aim above or below if it is hit accordingly. Aura Storm 0.8% (loop), 11.5% (final hit) Mega Evolves into Mega Lucario, then leaps up above the center of the stage, and firing a huge stream of Aura. Increases in power depending on Lucario's Aura and can achieve OHKO power at max aura if all hitboxes connect. Up Taunt: Floats in mid-air and growls, emitting aura from its body. Side Taunt: Moves one hand forward and one behind its back, growling. Down Taunt: Stands on one foot and holds one hand in mid-air. This taunt is very similar to Link's down taunt. Aura pulsates out of its paws, then does a crane-like stance, saying "Behold the power of aura." (満ちるぞ,この波導！, I am filled, with this wave guide!). Moves its paws in front of itself, then clasps them together, saying "The aura is with me!" (波導は我にあり！, The wave guide is with me!). Moves its paw to its side while aura radiates off its body. Lucario fights characters with counterattacks. Lucario was among the fighters summoned to the cliffside to fight against the army of Master Hands. Lucario was present when Galeem unleashed his beams of light. Lucario dodged a beam of light using Double Team, but was hit by a beam Greninja avoided a moment later, vaporizing it and placing it under Galeem's imprisonment along with the rest of the fighters, excluding Kirby. In the mode proper, Lucario can be found on the corner of a stone wall. Lucario's Fighter Spirit can be obtained by completing Classic Mode. It is also available periodically for purchase in the shop for 500 coins. Unlocking Lucario in World of Light allows the player to preview the spirit below in the Spirit List under the name "???". As a Fighter Spirit, it cannot be used in Spirit Battles and is purely aesthetic. Each Fighter Spirit has an alternate version that replaces them with their artwork in Ultimate. Additionally, Lucario's Mega Evolved form appears as a Primary Spirit. Lucario charging Aura Sphere on Find Mii. Lucario attacking Greninja on Pokémon Stadium 2. Using its dash attack on an aerial Squirtle on the Bridge of Eldin. Performing its neutral aerial in front of Samus on Prism Tower. Lucario using its down tilt on Snake on Moray Towers. Lucario, Wolf and Fox sleeping around Chrom with Super Leaf equipped on Living Room. Taunting with Mewtwo and Fox on Coliseum. Lucario and Charizard are the only characters to have had their Final Smash change between games only to have it revert back to the previous Final Smash. In Lucario's case, it had Aura Storm in Brawl, changed to Mega Lucario in Smash 4, and then reverted back to Aura Storm in Ultimate. However, Lucario does transform into Mega Lucario for the duration of Aura Storm in Ultimate. The Tip about Lucario's Aura being able to reach a multiplier of ×2.5 is both true and false: as of recent updates, ×1.6 is the maximum multiplier. However, Lucario at 0% has a ×0.6 multiplier on its attacks, making the net change about ×2.5. Lucario is the only Pokémon character whose animations are not mirrored. 1. ^ translates to "Smashing Punch"
2. ^ translates to "Thrust Punch"
3. ^ translates to "Armpit Punch"
4. ^ translates to "Wave Punch"
5. ^ translates to "Sweeping Punch"
6. ^ translates to "Body Drop"
7. ^ translates to "Cannon Punch"
This page was last edited on April 18, 2019, at 15:08.